Orthodontic care can have lifelong beneficial effects, not only on your dental health, but on your self-esteem and confidence as well. At Roberts Orthodontics, we believe in creating an individualized treatment plan to address your unique needs, and to provide that treatment in a comfortable and caring environment which will allow you to thrive. 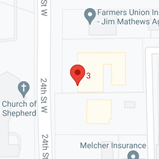 With an office located in Billings, MT and serving the surrounding communities of Miles City, Red Lodge, and Columbus, Dr. Michelle Roberts and our team look forward to meeting you and your family soon! Our emphasis on creating a customized care plan is possible because of the many treatment options we provide. From traditional metal braces and Clarity™ clear braces to clear aligner treatment with Invisalign®, Invisalign Teen®, and ClearCorrect™, we can help you achieve the smile you’ve always wanted. From the moment you walk in the door, you’ll realize you’re in the right place to receive the quality orthodontic care you desire. Please feel free to contact our office to schedule a complimentary consultation with Dr. Roberts today!